A hurricane is a type of tropical cyclone or tropical storm originating (for U.S.) in the southern Atlantic Ocean, Caribbean Sea, Gulf of Mexico or Eastern Pacific Ocean. A typical cyclone is accompanied by thunderstorms and can produce tornadoes, microbursts, and winds exceeding 155 mph. 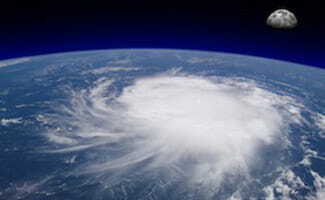 Hurricanes cause heavy rains and floods resulting in catastrophic damage to coastlines and several hundred miles inland. Slow moving hurricanes traveling into mountainous regions usually produce excessive rain and can trigger landslides or mud slides. The hurricane’s storm surge is water pushed toward the shore by the force of the winds swirling around the storm. This advancing surge combines with the normal tides to create the hurricane storm tide, which can increase the water level to heights that can cause severe flooding. The Atlantic hurricane season is from June to late November, with the peak season from mid-August to late October. The Eastern Pacific hurricane season is from mid-May to late November. If you live in one of these regions, it is important to understand the steps to hurricane safety. Visit our Disaster Preparedness Plan page to learn more about Tornado Safety, Thunderstorm Safety, Fire Safety Tips and developing an Emergency Evacuation Plan.